Linda R. Cox is Executive Director of the Bronx River Alliance and Bronx River Administrator for the New York City Department of Parks & Recreation. 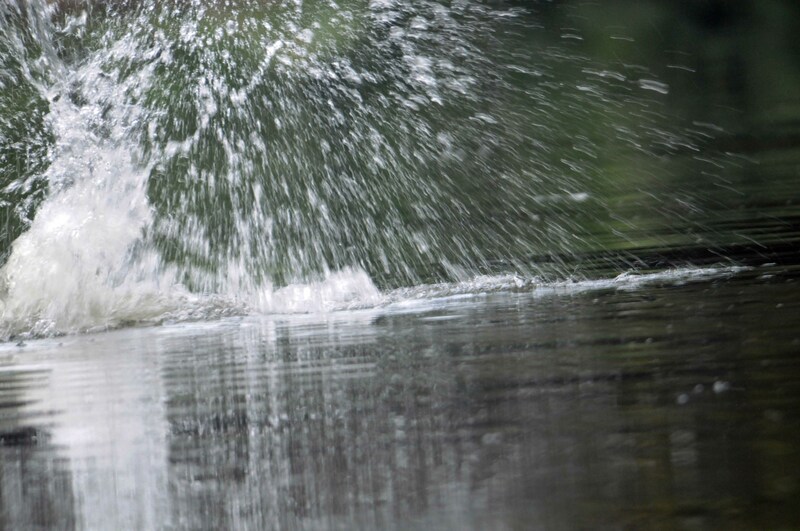 Photos: Steve Zack for the Bronx River Alliance. On an overcast evening last month, five canoes set off on the cool, still waters of the Bronx River amid the shaded forests of the Bronx Zoo and The New York Botanical Garden. We were four Bronx River Alliance staff and seven intrepid adventurers, all on the search for José the Beaver. José, named in honor of Congressman José E. Serrano for his unstinting support of the Bronx River’s revitalization, has lived on the Bronx River since 2006. Nonetheless, he is seldom seen. Even Josue Garcia and Miguel Rodriguez, who led hundreds of paddlers down the river this summer, had not seen him. But this time we had chosen José’s favorite hour for activity—dusk. Our hopes were high. Five wildlife biologists were with us to help witness José’s life on the river. We paddled upstream, passing under Fordham Road into the Botanical Garden, and there he was, floating in the water under a willow tree. With the top of his head and back visible, José swam away from the tree, gave two mighty thwacks with his tail, and dived under the water, suddenly gone, invisible. It was clear from chewed-away bark and a dangling limb that we had interrupted his dinner. All boats gathered across the river from the willow and waited in silence. No sign. First one boat and then another headed upstream. Twenty-five yards up, the riverbank showed clear beaver tracks. Each quiet canoe filed past. As we returned to the willow, a dark mass became José. He set out across the river, smacking the water in view of all boats before submerging. We hovered near the tree. Fifteen minutes later, José reappeared, 50 yards downstream. He zigzagged several times across the river, making it clear this was his territory, not ours. Another smack of the tail, and he disappeared again. Night was falling. The lights on the Bx12 bus reflected on the water as the bus crossed the bridge. Reluctantly we left José to finish his dinner and we paddled away. A final look upstream revealed José slipping across the river, barely in view. 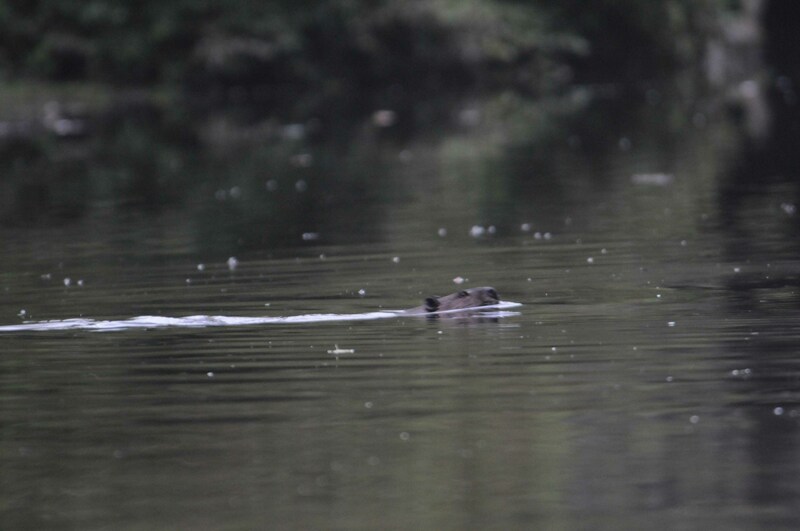 Although we had heard several reports of a pair of beavers, or even two adults and a little one, only one was visible this evening. Yet the tail slapping is a warning to other beavers. Was this a signal that more than one was present? When we searched for tracks on the riverbank, we saw the paw prints and tail markings of an adult and—could it be?—much smaller prints of what might be a juvenile beaver. 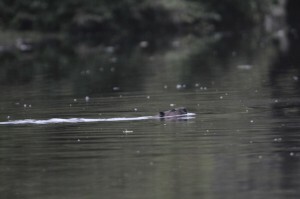 Indeed, just last week two beavers were spotted on a stretch of the river through the Bronx Zoo. José seems to have a friend—or mate?